Google+ first introduced the pinning feature for communities. But it is now made available for profile pages as well. That means you can choose to pin any post on your profile (self posted or shared) and it will always be visible on top when ever somebody visits your profile page. The only restriction is that the post must be publicly shared. Private posts can't be pinned as of now. How To Pin a Post in Google+. To pin a post in your profile page, just click on the down arrow on top right of the post and choose the "Pin Post" option. Your post will now stand out on the top and it will be marked as "Pinned" as well. For pinned posts an "Unpin" option is also available from the same menu. 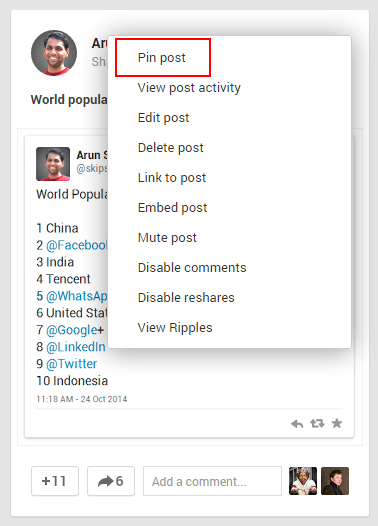 As of this writing, posts can be pinned only with a desktop web browser. Although pinned posts will be visible at the top in android devices, support in iOS is on the way. P.S. If you don't see the option right away, do a refresh of the page using F5 and try again. This Is The Best Website For Commenting I Know A Website Where You Can Buy Product Very Easy Steps You Can Visit To Know More:--> http://kandeo.com.ng offers cheap quality products online such as fashion, phones, electronics, home and kitchen appliances at great prices.